Verdon College is taking pandemic planning seriously but hopefully it will not come to this! A new set of web pages have been added, under the links section, to make available more information to the Verdon community. The College will be following the recommendations of the local Medical Officer of Health when any decisions are being made about student attendance. We will try to make sure that disruptions to student learning are kept to a minimum. Please make sure that family contact information is current. 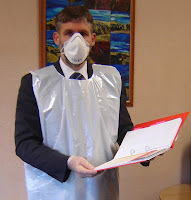 The office need at least two people who could be contacted in the event of sickness or school closure. The Verdon Online service, using Google Apps, will be available to students and staff who are not sick and would like to work from home in the event of a school closure. Students will need to make sure they have a current password well in advance of such an event.